Tim Lingle has a few undead elk on his hands. “We get a lot of false notifications that elk have died,” Lingle explains over the phone from his office in Pinedale, Wyo. As the Wyoming operations manager for North Wind Resource Consulting, it’s his job to keep tabs on the 46 GPS-collared elk that roam the mountains near Denbury Resources’ gas processing facility. The collars the elk wear include a motion-sensor device, similar in shape to a ball bearing. If the sensor doesn’t move for six hours, it triggers an automatic email to Lingle’s inbox. Lingle thinks some of the motion sensors must have gotten stuck, and that’s why he’s getting notifications that some elk are dead. Knowing where and how far these elk roam is part of an ongoing study, sanctioned by the Wyoming Game and Fish Department (WGFD), that North Wind is running to keep its client, Denbury Resources, in compliance with the WGFD and the U.S. Bureau of Land Management (BLM). In 2008, when the plant was owned by Cimarex Energy, the company agreed to conduct a study to determine whether the elk were being displaced from their native winter range. In case of displacement, Denbury has set up a mitigation fund to pay for habitat improvements. To collect the data, North Wind hired a crew that specializes in aerial services for wildlife capture. 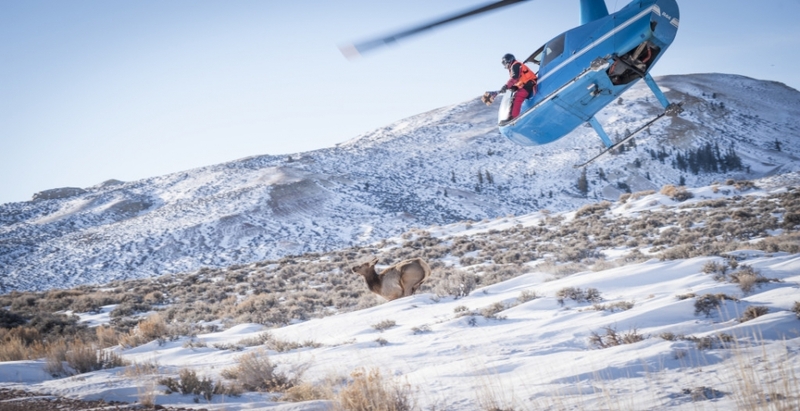 Perched in the doorway of a low-flying helicopter, crew members shoot a net at the targeted elk, then quickly land. Once an elk is netted, workers hobble and blindfold the animal to keep it calm while they place the collar and take a blood sample for brucellosis testing by the WGFD. Once the collar is on, the elk is released. This is the only contact the capture crew will have with the animal; the collars are timed to drop off automatically in May 2017, at which point Lingle or his colleagues will retrieve them. Sometimes, though, it’s not that straightforward. Local hunters often end up with a collar or two in their possession. Most collars are returned to WGFD, but some end up in strange, and sometimes unsavory, places. Much of Lingle’s work consists of interacting with the public, explaining the purpose of the study or fielding phone calls anytime Denbury starts “flaring,” or burning off excess gas. The rest of his work, he says, is “number crunching and slicing up data.” And the data tells him that local elk, initially spooked by the flares, soon grew used to them and returned to their habitat. The data tells him that, while the goal is for 40 percent of the elk to stay within the crucial winter range around the facility, 56 percent are currently using the area. But common sense tells him that dead elk don’t wander. So he’ll reprogram the motion sensors in the collars via satellite to alert him if an elk doesn’t move for eight hours, instead of six. Then he’ll download more data, mapping out where the elk have traveled so he can report back to WGFD and BLM. “We’re just trying to provide sound scientific data to both our customer and the agencies,” he says. Article originally printed in Cook Inlet Region Incorporated (CIRI)’s March 2015 newsletter, the “Raven’s Circle” (available at www.ciri.com/shareholders/ravenscircle/).